The hand of the Lord was on me and He brought me by His Spirit and set me down in the middle of the valley; it was full of bones. He led me all around them. There were a great many of them on the surface of the valley., and they were very dry. 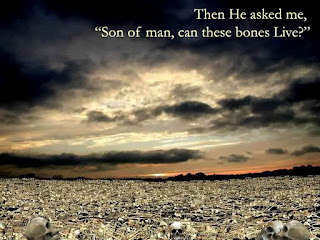 Then He said to me, “Son of man, can these bones live?” I replied, “Lord only You know.” He said to me, “Prophesy concerning these bones and say to them: Dry bones, hear the word of the Lord! This is what the Lord God says to these bones: I will cause breath to enter you, and you will live. I will put tendons on you, make flesh grow on you, and cover you with skin. I will put breath in you so that you come to life. Then you will know that I an the Lord.” So I prophesied as I had been commanded. While I was prophesying, there was a noise, a rattling sound, and the bones came together, bone to bone.As I looked, tendons appeared on them, flesh grew, and skin covered them, but there was on breath in them. He said to me, “Prophesy to the breath, prophesy, son of man. Say to it: This is what the Lord God says: breath, come from the four winds and breathe into these slain so that they may live. !” So I prophesied as He commanded me;the breath entered them, and they came to life and stood on their feet, a vast army.